Super schönes Hostel, wenn man es denn überhaupt Hostel nennen darf, es ist viel mehr wie ein Hotel. Super nah, fast schon am Strand gelegen und zu Geschäften hat man es auch nicht weit. Die laute Musik die von 8-23 Uhr spielt hat mich überhaupt nicht gestört, der Ventilator im Zimmer hat es sowieso übertönt. Ich würde auf jeden Fall wiederkommen! 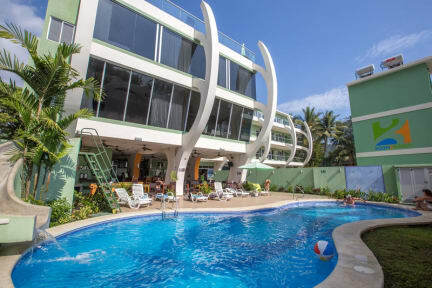 It is a great hostel, located directly at the beach. It was my second time I came to this place and I liked it as much as the first time. The facilities are great, it is super clean and the staff is super nice and helpful. The hostel offers everything you need. The Yoga lessons are amazing, so are the surfing lessons (Ali is the best!). I had a great time in Jacó and at Room2Board and I will for sure come back! Perfekt Hostel! We came here twice during our backpacking trip in Costa Rica. There is really something for everyone. A huge rooftop with hammocks, a pool area with a bar for random properties, a surfshop and the beach 1 min away by foot. The owner is also really nice. He gaved us an upgrade of the room for free, he helped me with my paperwork and he would organize bonfire if you ask him. All in all just a perfekt hostel! Sehr schönes Hostel, sogar mit Wasserrutsche. Etwas ab vom Schuss und für die A/C muss man leider extra zahlen. Sonst ließ nichts zu wünschen übrig. Best Hostel ever!!!! More like a hotel than a hostel. Great ppl, very clean, modern. Would def come back. Hostel ist voll modern und sauber. Lage ist direkt am Strand. Ist für Partyliebende bestens geeignet. Getränke&Essen an der Bar etwas teuer, Angebot ist ok.
Great hostel with beach view! Good place to try surf and yoga. We were a bit disappointed staying in this hostel since we trusted the previous reviews. We were looking for a place where we could hang out and meet people our age, but we were confronted with a place that gave us no hostel vibes at all. People were a lot older than usually and the "great rooftop terrace" was closed due to a wedding reception going on there?! the Staff was, apart from the lady organizing our trips, rather unfriendly and unhelpful. at least the room was clean!